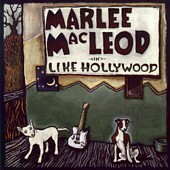 Marlee MacLeod effortlessly blends Americana and pop-rock to create her latest, Like Hollywood, an upbeat, solid collection of warm, friendly songs that go from simplistic acoustic guitar and voice numbers to full band compositions. Her voice relaxes while the music soothes, with the words painting a storybook in your head. I'll give this a B-.